The Rock, as it appeared by the late morning of September 7. UPDATED: September 10, 2017, 9:56 p.m.
On Tuesday, September 5, Attorney General Jeff Sessions announced plans to rescind the Deferred Action for Childhood Arrivals (DACA). DACA defers the deportation of over 800,000 people under the age of 31 who came to the U.S. as children and allows them to apply for work permits. On Wednesday, September 6, Albion College students came together on the Quad to paint the Rock in support of all individuals, especially those in the campus community, who are protected under the Obama-era program. 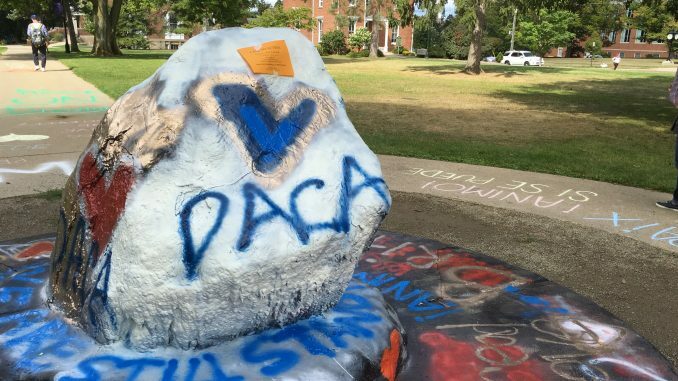 “We ♥ DACA” was painted on the Rock’s face while “WE SUPPORT DREAMERS” circled its base. (DREAMers is a term used colloquially for those supported by DACA). On Thursday, September 7, the College awoke to find the Rock painted black. “Trump 2017,” “MAGA” (Make America Great Again) and “Pence 2020” covered the Rock in red and white spray-paint. 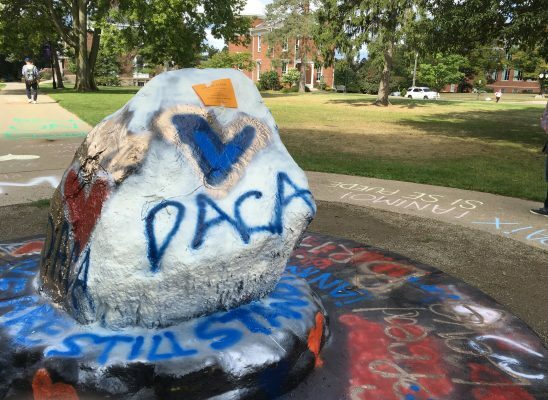 By 11:00 a.m., students again came together to paint the Rock in support of DACA. 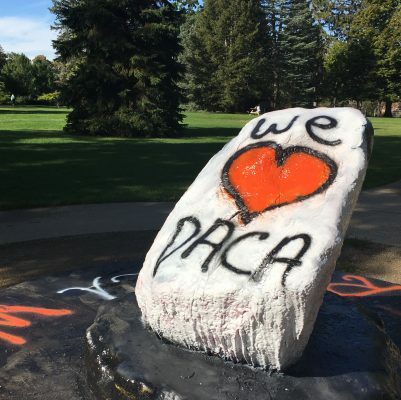 The phrase “♥ DACA” was painted on its face while words of love and support, in a multitude of languages, were chalked down the sidewalks extending from the landmark’s base. Students surrounded the circle, holding hands in unity. The Rock, as it appeared September 6. Colmenares and other students stood by after the repainting, keeping an eye on the Rock and passing out flyers for a meeting to be hosted by the Organization for Latinx Awareness at 7 p.m. There DACA information and a discussion of the day’s events would take place. At 12:50 p.m., President Mauri Ditzler shared an email with all students on campus expressing his support of the College’s DACA students and encouraging others to do the same. Ditzler’s response reflects the impromptu meeting he had with students shortly after the Rock was repainted. Students asked Ditzler to publically denounce the Rock’s face that was painted overnight. At 7 p.m., a long line gathered outside the Umbrella House for OLA’s first meeting. The scores of students and a dozen or so faculty quickly filled up the House’s living room, prompting the meeting to be moved to Upper Baldwin. By the end of the night, almost 300 people had signed in to the event. Dr. Lynn Verduzco-Baker, sociology professor, began by discussing common myths of DACA recipients and what Sessions’ decision to rescind DACA meant to those affected by it. Members of OLA then described their own experiences with DACA and the day’s events, opening the floor to audience members. Among those was President Mauri Ditzler, who stated that education was the best long-term solution to end hatred. The meeting concluded with OLA members and Connor Healy, a junior from Southfield, Michigan, providing audience members with information on how to contact one’s U.S. Senators to encourage them to take for DACA. This is not the first time disagreements have arisen through the Rock. In April 2016, students spray-painted the flags of Mexico and the United States after “#BuildAWall” and “Trump” were written on it. Photos by Beau Brockett Jr. and Jasmine Maddox. 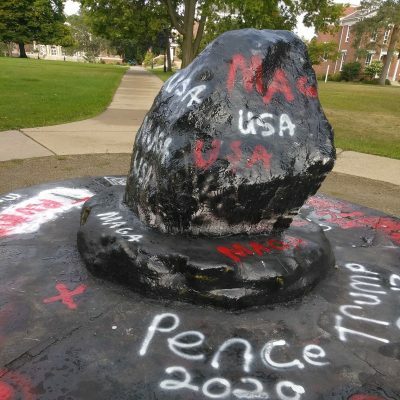 The President’s campaign slogan, combined with support for his running mate, constitute “messages of hate.” And the president of the college is “disappointed” that the Rock is being used to express such opinions. I’ll keep this in mind when I get the next fundraising letter. Proud to be a Briton. There is room for differing opinions and reasoned debate, even in these days when we are being challenged to demonize one another. Show the world what liberal arts and tolerance can be!